Most sounds you hear, from the whisper of the wind to the wail of a siren, are simply moving air. When a noise is made it causes the air to vibrate, and these vibrations, also known as sound waves, carry the sound to your ears. I’m curious to know what sounds you like best. Below are a few of my favorites. Take five minutes or less and leave your favorite five in the comment box! I hope these sounds fill your ears today. Happy Friday everyone! 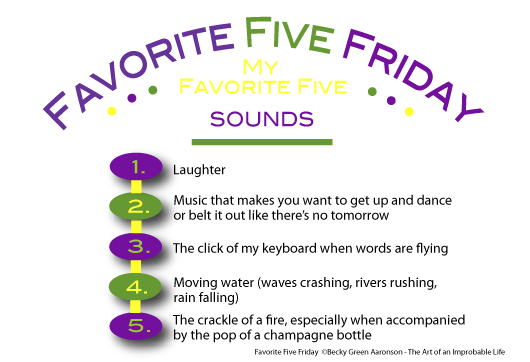 This entry was posted in Favorite Five Friday and tagged Becky Green Aaronson, Favorite Five, favorite five friday, lists, sounds, top five by Becky Green Aaronson. Bookmark the permalink. Heart beat, Computer keypad press sound, Cell ringtone, Calling bell and Birds sing! These all tell us how much connections mean to you! Great stuff. Thanks for sharing them. These are great, Jacquie. I especially like silence. Aaahhh…it’s so rare around our house. Nature and laughter seem to be the universal sounds that bring us the most joy. Thanks for sharing your favorite five, Rosemary. It’s always great to see you here! These are great, Krista. I have to chuckle about the dishwasher though. At least you didn’t say the hum of of the vacuum cleaner! But, I can appreciate what you’re saying about feeling “at home.” Thanks for adding your five to the conversation! Happy weekend. I love how your five immediately conjure up images in my mind. There’s nothing like a sound to trigger our emotions. Well, I don’t have time to come up with a list, but I love yours, so I’ll second that! Life definitely gets busy! I appreciate you taking the time to swing by and say hello. I’ve been by your blog a couple times recently and wrested with leaving a comment, and had to give up. I’m sure it’s just me (and my lack of patience), but I will try again!! I love your blog! 1) Bach played on a Steinway piano. 2) Sizzle of bacon frying. 5) Wind blowing in the trees. Yours are great, Jessica. And I bet you are hearing a lot of laughter from Isa as she tries out surf camp this week! Loved your latest post. I think we all need to have a relaxing gathering at the beach with music and share some laughs. Not sure your cat would be purring though! Thanks for sharing your favorite five! Have a great weekend. With your five, I’m picturing a group of close friends sitting on the veranda of a beach house laughing and telling stories, soft music on the radio, waves lapping along the shoreline, birds singing in the trees, wind chimes dancing in the gentle breeze. Aaahh. Now that sounds like a perfect Friday to me! Thanks for sharing your five!